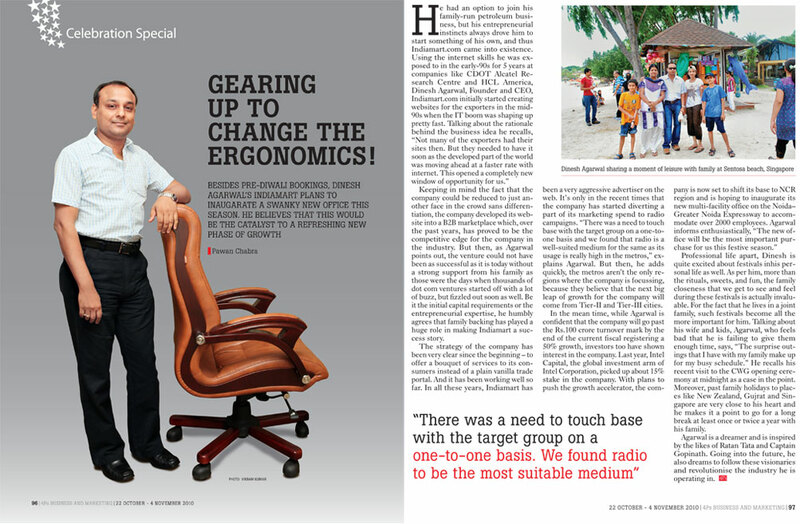 Gearing up to change the ergonomics! Keeping in mind the fact that the company could be reduced to just another face in the crowd sans differentiation, the company developed its website into a B2B marketplace which, over the past years, has proved to be the competitive edge for the company in the industry. But then, as Agarwal points out, the venture could not have been as successful as it is today without a strong support from his family as those were the days when thousands of dot com ventures started off with a lot of buzz, but fizzled out soon as well. Be it the initial capital requirements or the entrepreneurial expertise, he humbly agrees that family backing has played a huge role in making IndiaMART a success story. The strategy of the company has been very clear since the beginning – to offer a bouquet of services to its consumers instead of a plain vanilla trade portal. And it has been working well so far. In all these years, IndiaMART has been a very aggressive advertiser on the web. It’s only in the recent times that the company has started diverting a part of its marketing spend to radio campaigns. “There was a need to touch base with the target group on a one-to-one basis and we found that radio is a well-suited medium for the same as its usage is really high in the metros,” explains Agarwal. But then, he adds quickly, the metros aren’t the only regions where the company is focussing, because they believe that the next big leap of growth for the company will come from Tier-II and Tier-III cities. Professional life apart, Dinesh is quite excited about festivals in his personal life as well. As per him, more than the rituals, sweets, and fun, the family closeness that we get to see and feel during these festivals is actually invaluable. For the fact that he lives in a joint family, such festivals become all the more important for him. Talking about his wife and kids, Agarwal, who feels bad that he is failing to give them enough time, says, “The surprise outings that I have with my family make up for my busy schedule.” He recalls his recent visit to the CWG opening ceremony at midnight as a case in the point. Moreover, past family holidays to places like New Zealand, Gujrat and Singapore are very close to his heart and he makes it a point to go for a long break at least once or twice a year with his family. Agarwal is a dreamer and is inspired by the likes of Ratan Tata and Captain Gopinath. Going into the future, he also dreams to follow these visionaries and revolutionise the industry he is operating in.